The process begins simply with an email. A little introduction of yourself and your cycling background, and a brief outline of the type of bicycle you would like and what you intend to use it for is a great place to start. If it looks like we’re on the same page after an email or two, I really like to have a chat on the phone. I really think this feels much more personal and can help you to feel a bit more at ease with placing your non-refundable frame deposit. Once a deposit has been placed, I will create a folder of any ideas you already have. This way when we meet to discuss your bike there will be a starting point to refer to. Photos of bikes are great, as they can give me an idea of your style and help to give direction when planning the frame details, paint and components. Please don’t feel you have to send photos though, as I like to take inspiration from a variety of sources. Workshop visits are more than welcome. Most of the time, it makes the most sense to tie these in with your bike fit. But, if you’re passing and need an excuse for a weekend away or simply just fancy a cuppa and a chat about your bike, I’m happy to entertain. York Cycleworks Bike Fit Studio. More often than not, the first time we physically meet is at your bike fit at York Cycleworks. Either Fraz, John or Ryan will initially assess your strength and flexibility to determine the measurements which we can work with on the fitting jig. The bike fit starts literally from the ground up; from the arches of your feet, all the way up to your shoulders and neck: Nothing is left unconsidered. Following your bike fit, we’ll be in in a position to think about what tubing will be suitable for your frame. The choice will be determined by the size, weight, purpose and style of your bike, as well as your weight. Will it be classic with lugs and round tubes, or modern with varied tube shapes designed to squeeze out every ounce of performance possible? Maybe it will be stainless steel, perfect for those wanting a bike to ride throughout the four seasons or those who live somewhere coastal where the air is a bit salty. I can build bikes using varied tube shapes to make the bike ultra-absorbent if you regularly ride roads that are a bit rough and want to avoid being shaken around; although steel is already well known for its natural elasticity and ability to absorb uneven surfaces, it can be made even better with a bit of manipulation. These are all things that we can talk about to make sure you go away with something both you and I can have one hundred percent confidence in. 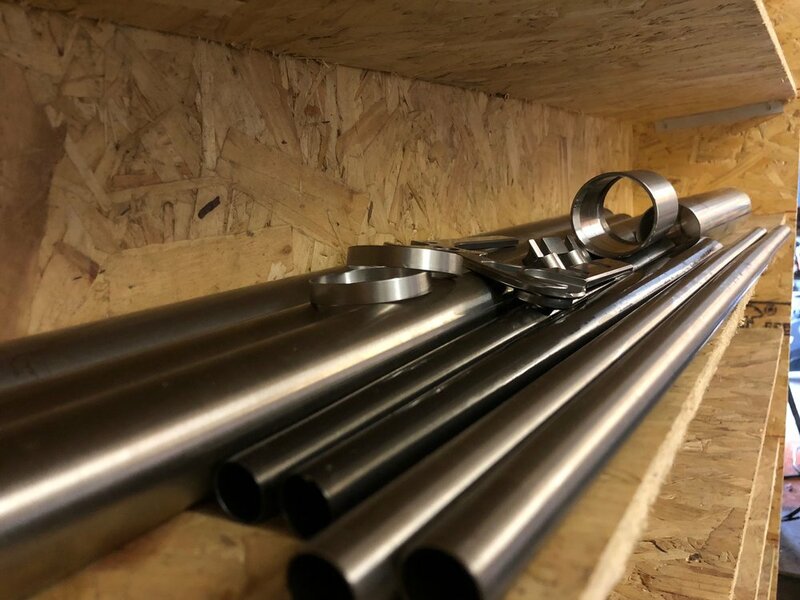 Reynolds 953 stainless steel tubing waiting to be built into a winter bike. Frame design also follows your bike fit. As well as building the frame so it’s the perfect size for you, I will also think about which components are needed to give the bike the perfect look and performance. I will focus carefully on both the handling and the proportions. Nothing looks worse than a stem which is too short for the bike because the frame is too big. There are exceptions to this of course; it all comes down to the different styles of bike and the way they handle when ridden on the intended terrain. Next, we will discuss the components. Which parts the bike will be built from depends on a number of factors: Performance, aesthetics, comfort, compatibility, budget and, most importantly in my opinion, consistency. I work with component manufacturers from all over the world and there is almost nothing that I cannot supply. Some things can take longer than others to get hold of, which is why I like to begin work on the build kit sooner rather than later. Ideally, we’ll complete this process around two months prior to the frame being built. Mitred modern road bike frame in the frame fixture. Before the frame build itself begins, paint design is also high on the agenda. Although not essential, a visit to the workshop is useful when it comes to choosing paint colours. My painter, Jack, can use just about any car or motorcycle colour as well as high end custom paints from the likes of House of Kolor and other top paint manufacturers. Jack and I have always got new ideas in mind for paint designs, so if you’re struggling to come up with your own, we are both more than happy to help. More often than not, choosing your paint is the most difficult part of the whole process. Whether it’s the colour or design, the options are so plentiful that it can be quite an overwhelming task! This is one of the main reasons that I ask you to supply me with images of things which are of great interest to you, as they will really help to guide the direction we go in. Now for the exciting bit - for you and myself alike. I love it in the workshop. It’s the place where I feel the most at home; where I can really better myself and my craft, and where a pile of tubes turns into something really special. It’s where, as many people like to put it, ‘the magic happens’. The moment I post a photo on Instagram of that first cut being made to the seat tube is the moment it all begins to feel real and hopefully, you can start to really feel excited! Over the next 3-10 days, you will see the 2D CAD drawing you’ve been looking at start to turn into that dream bike you’ve been telling everyone about. Once the frame is built, I will invoice you for the frame fabrication. This is basically the frame cost minus the deposit, bike fit and paint. Leftovers at Jack’s paint workshop. Once the frame is built and we have hopefully made the difficult decision of which colour and design to go with, it’s time for the frame to head to Jack over in Hull. Jack is one of the biggest perfectionists I have ever met. My dedication to building the ultimate frame combined with Jack’s determination to not let anything other than absolute flawlessness leave the doors of his workshop leaves everyone involved with something to be incredibly proud of. The frame is then collected in person and brought back to York. If it’s not stainless steel, it undergoes rust proofing using an oily substance that sets like wax on the inside of the tubes. Not only does this protect the frame from future moisture exposure; it also displaces any moisture that may have built up inside the frame already as it moved through different environments. Post assembly outside the workshop. Now it’s time to put the jewellery on. I assemble every bike myself with the same attention to detail that the frame received. The contact points taken from your bike fit are set up with millimetre precision. From the instant you clip into the pedals, you’ll know the bike was built for YOU and only you. As soon as the bike is ready, the final bill will be invoiced. This covers the cost of the paint and any extras you requested for the custom paint and design. The only time this will be billed without the bike being complete is if there are any parts that are on back order and not yet with me. Since we allow plenty of time to get the parts ordered, this will be a very rare occurrence. Finally! The reason you rode a bike in the first place, only better! It’s time for you to enjoy the wonders of a custom steel bicycle, built just for you. I prefer to have bikes collected once they are finished, as this avoids any risk of damage occurring during delivery. I have, however, made many personal deliveries over the years. I have taken bikes all over the UK as well as to France, Switzerland, and the Netherlands. Nothing compares to seeing the smile on your face, or, better still, letting you show me your local roads on the first ride. Whenever time allows for it, it’s always a pleasure to take you out for a spin here in Yorkshire too.